Hail is large, layered ice particles, often spherical in shape, which are produced by thunderstorms having strong, tilted updrafts. 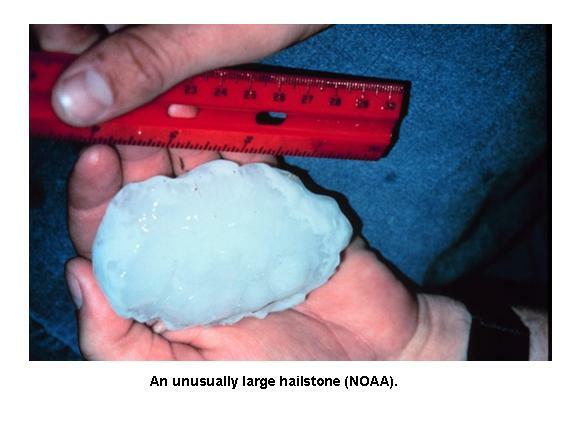 Hailstorms form within a unusually unstable air mass, that is, an air mass in which the temperature falloff with height is much greater than normal. The unstable air is necessary to produce large updraft speeds -- fast enough to keep a developing hailstone from falling to the ground. Some of these updrafts can reach 60 mph or more. In a hailstorm, small ice particles that form above the freezing level (which occurs in all thunderstorms) collect either rain water or cloud water on them, forming a water shell that freezes. The tilted updraft and downdraft structure of the storm is important in order for hailstones to grow because they can be 'recycled' several times, until they either become too large for the updraft to carry them, or they get caught in a downdraft, and they finally reach the ground. DEADLY HAIL STORMS IN INDIA: As the summer monsoon season approaches in India, it is not unusual for there to be severe thunderstorms. Some of these produce deadly tornadoes and hail. Possible the worst hail disaster in India occurred in 1888, when close to 250 people were killed by falling hail -- some died immediately, others died later from their injuries.